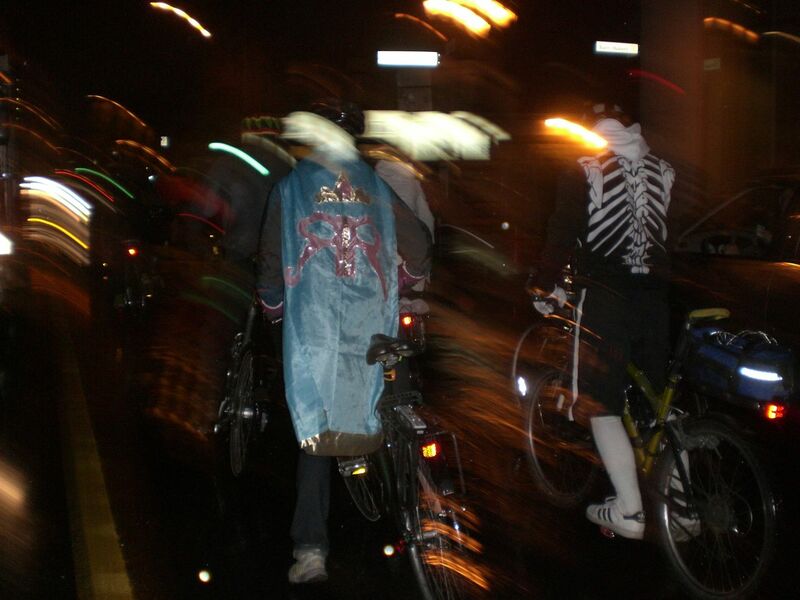 One of my favourite cycling events of the year, Halloween Critical Mass, is quickly approaching (26 October). 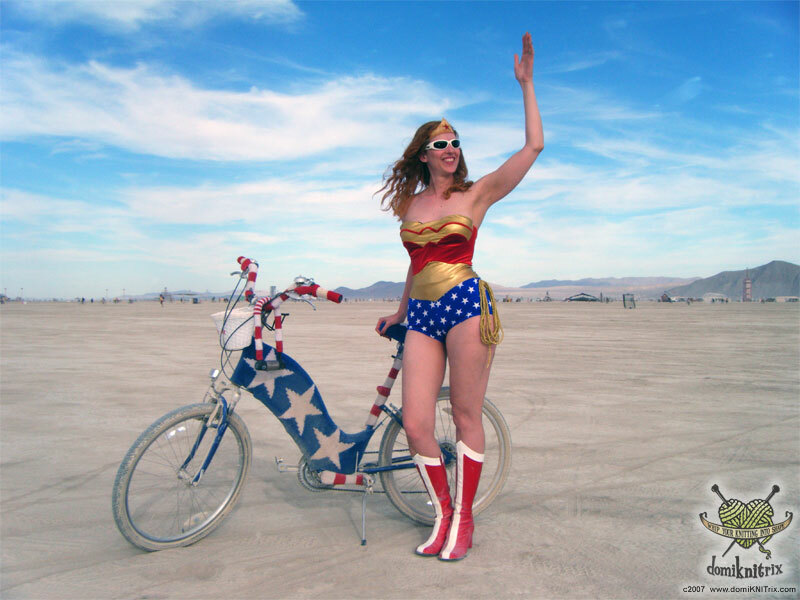 Before it gets too late, I wanted to start thinking about bicycle-related costume ideas. Though I wouldn’t dare attempting such tricks on my bike. While I like the “bike-as-horse” idea, there are so many more options. At last year’s ride we had an awesome Harry Potter Quidditch duo on bicycle-broom-sticks, a bee on a bike, and Bananas in Pyjamas on a tandem! But, what to do for this year? Rather than actually doing any work on my thesis I have been scouring the internet and my brain for ideas. Here are a few I have come up with. Tracy Morgan dressed like a cellphone riding a bike. Peewee Herman, on his beloved bike! David Byrne, looking dapper as always with his bicycle. I must stop for a moment and brag about the fact that once I met David Byrne. Or, better yet, the paperboy from Better Off Dead? The Wicked Witch of the West… you even get your own theme music! Audrey Hepburn is classically cool. Jacques Tati from Jour de Fete? Data from The Goonies… or go as any of the Goonies! Vintage Bike Polo girl… may help if you have actually played Bike Polo (Saturdays 2 Pm Aro Valley basketball court). Miss Piggy, Kermit the Frog, any of the other Muppets on bikes. Kevin Bacon from Quicksilver. I have never heard of nor seen this movie but it could be a cool look for fixie riders! Napoleon Dynamite… bonus tow rope for your pal on roller blades! How about a singing bicycle riding nun?! 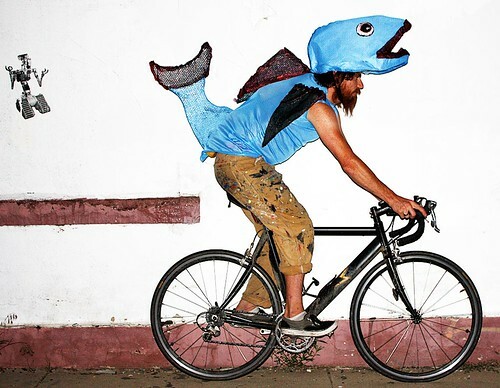 A woman needs a man like a fish needs a bicycle… maybe fish DO need bicycles? In which case, I better find a man! Perhaps a gallant knight atop a fixie steed? 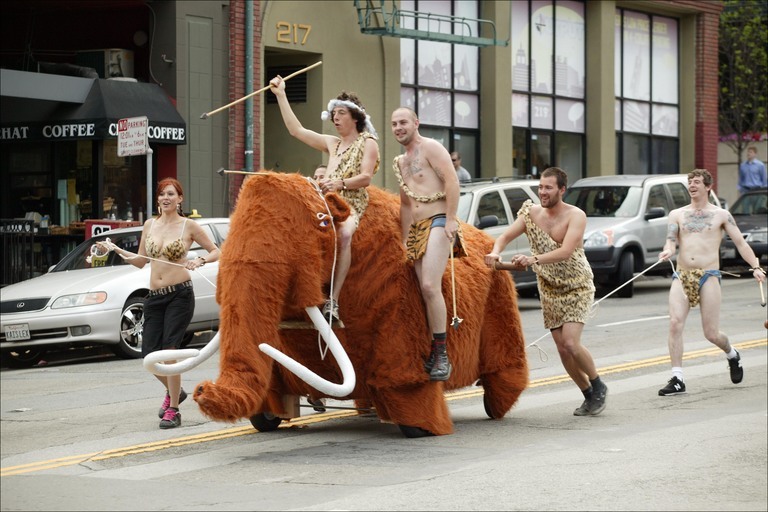 Bike-as-wooly mammoth + cave person? 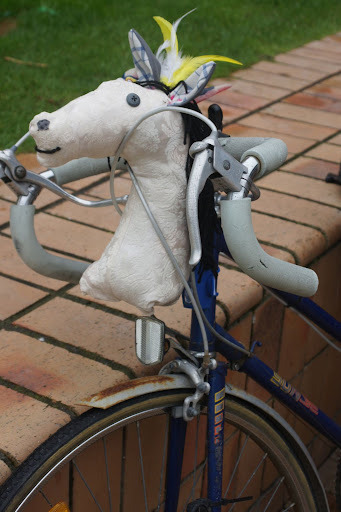 Or, turn your bike into a white wolf and dress up as San the wolf princess! I am hatching an idea that I do not intend to give away here lest some one steal it, but if you have any other suggestions please contribute! Wellington Critical Mass, Halloween, and Facebook. As I mentioned previously, I hate Facebook but I love bicycles and Halloween. 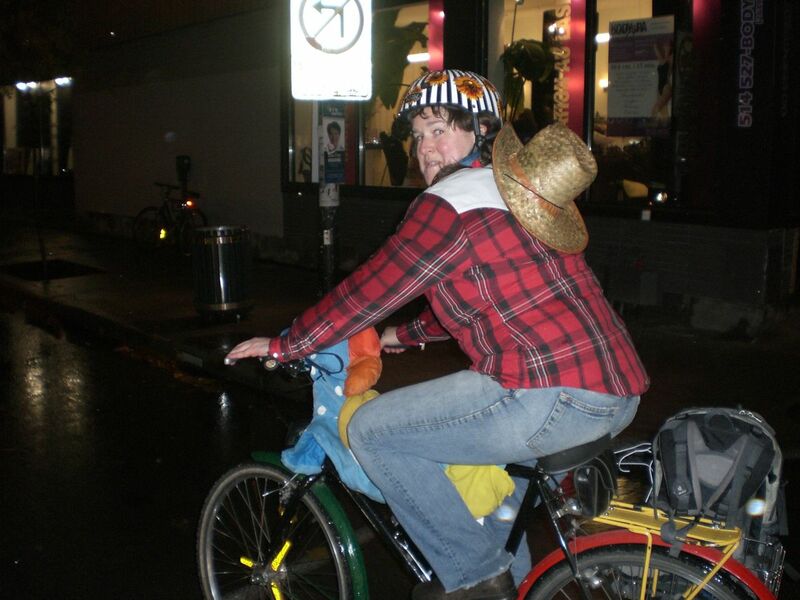 Previously, when I tried to find any information online about Critical Mass in Wellington…. I thought there wasn’t one. First, try googling “Wellington Critical Mass”. The best result is the NZ Critical Mass website, which seems to be based in Auckland and doesn’t give many details about Wellington’s event. You could show up and be the only person there. In addition, the “Cycling in Wellington” site barely makes a mention of Critical Mass, and nothing about this week’s ride as of today, Wednesday 26 October. It’s not listed on the events calendar nor are any details given. So, if you’re just a lonely girl with no cyclist friends but you want to participate in bicycle activism what are you to do? Well, if you are lucky enough, you’ll come across a flyer in an op shop in Newtown, and know about the event even if the details on the international network are scarce. 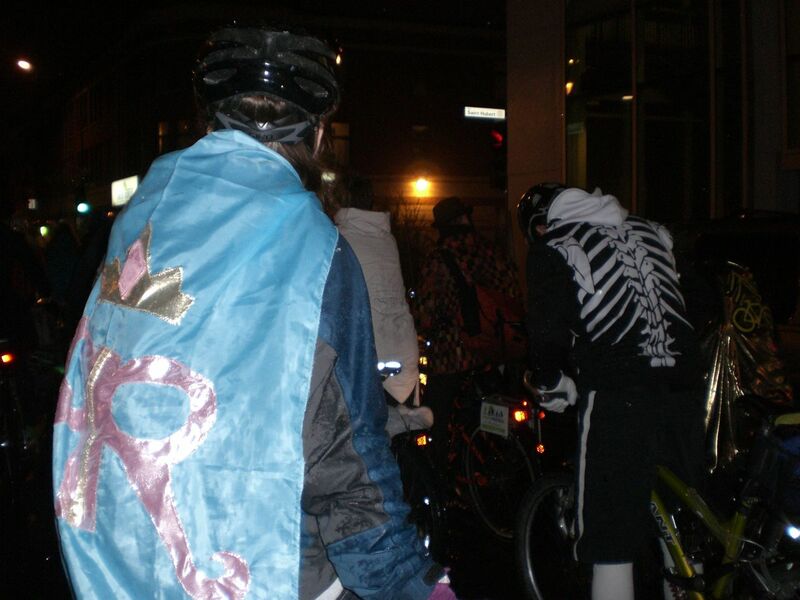 Here are some pictures from the last Halloween Critical Mass ride I went on, I’ll try to get better ones this year. That’s Sonya’s “Reyna Rosa” cape fluttering in the wind. “Joan Holloway” was my inspiration for Halloween this year. I used the New Look 6968 pattern, the collar was a nightmare, but I learned how to put in an invisible zipper! I don’t fill out the top half quite as well as Joan does, but I will certainly wear this again! As I type this, I am sitting aboard a Coach Canada bus headed for Toronto, coming from Montreal. I am traveling at approximately 100 kilometers and hour. This bus is equipped with wi-fi. Technology!!! It seems very strange to me that I am able to access the internet without using any sort of telephone or dsl or ethernet cables involved at all. I remember when I went to France, after being in West Africa for over a year, and suddenly there was wi-fi internet at the school I had gone to. It blew my mind that you could access the internet without a cable! However, that’s all become old news, and you still have to have the wireless router attached to a cable somewhere. But here I am, posting to Word Press, totally wirelessly! It’s amazing! Anyway, I am heading back to Chicago for 2 reasons. I got a job! A job that requires me to re-enter Canada and apply for a work-permit at the “Point of Entry”. Also, I don’t have any winter clothes in Montreal and want to get a few things from mom’s basement. As of Monday, November 8th, I will be the new Branch Librarian at the Montreal Children’s Library Richmond Square Branch, located in Little Burgundy. I’m so excited !!! I also found a new place to live, sans cats, in St. Henri, a 15 minute walk from Richmond Square. Everything seems to be working out in the best possible way for me right now. The universe is finally aligning in my favour!! I had a great Halloween, despite my boyfriend’s best attempts to sabotage the festivities. 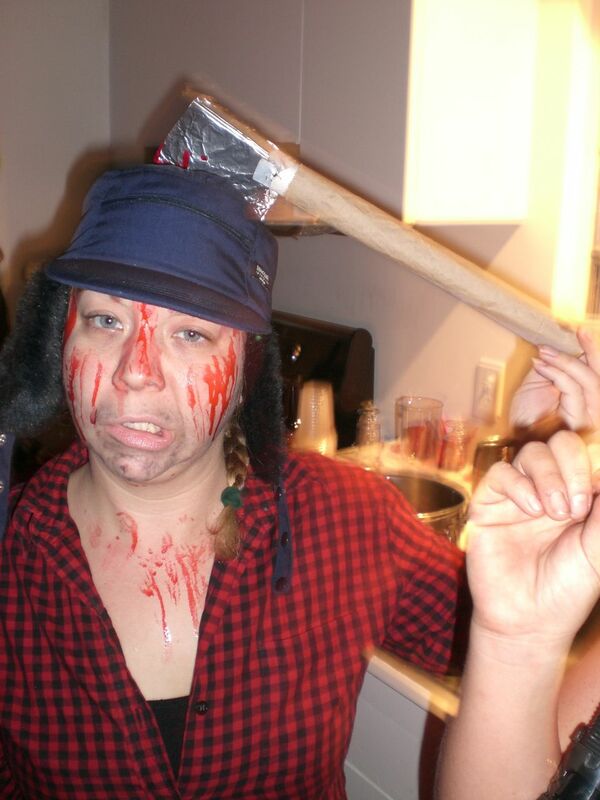 In a last minute turn of events, I decided to be a dead lumberjack.